There may be a monster in your child’s closet. All of the reassuring you may have done when your child was little that there was “no such thing as monsters”, checking under beds and in closets to alleviate anxiety, may not have been exactly true. For transgender kids and adolescents, and even adults, a Dysphoria Monster may be lurking nearby. When I worked in a residential treatment facility for children, I used the “Addiction Monster” metaphor to explain addiction to children. Many children who resided there had parents who were addicted to substances, and this resulted in inconsistent visits, broken promises, and time away in jail. I would explain that when someone is struggling with addiction, they have an addiction monster that is sometimes small and manageable, sometimes huge and overpowering, but never nonexistent. When it’s huge, it has them in their grip, throwing them around, banging them up, holding them hostage. When the addiction becomes more under control, the individual may have more power over the monster, like walking it on a leash. After some time of sobriety when urges have decreased dramatically and the individual is in recovery, the monster may get small enough to tuck away in their pocket. But remember: it’s always there, and they would need to take care to keep it small. Now that I work with transgender individuals, I have met the Dysphoria Monster. For those of you who don’t know, dysphoria is the discomfort and depression that can come with having a body that does not line up with one’s gender identity, or come from not being read as/treated as the gender one is in their brain. Dysphoria can range from unpleasant to life-threatening; it’s a force to be reckoned with. Most transgender people experience and relate to dysphoria differently. Some have very little (tiny dysphoria monster tucked in their pocket), some have debilitating dysphoria (picture the gender dysphoria equivalent of Godzilla). Dysphoria can fluctuate on an hourly, daily, weekly basis. How much dysphoria is present on a day-to-day basis can be dependent on temperament, life experience, support, stage of transition, relationship status, triggers, and much more. Here is an example of how the Dysphoria Monster can work: picture a female-to-male individual walking down the street with a female friend. He’s feeling good; confident, content, enjoying the day. His monster is quiet; he doesn’t really notice it. Suddenly he and his friend enter a restaurant and they are greeted with, “Hello, Ladies!”. His monster is awakened! Growling, breathing down his neck. The monster sits with them at the table for the rest of the meal as he agonizes over being misgendered. Ever heard of the expression “don’t poke the bear”? 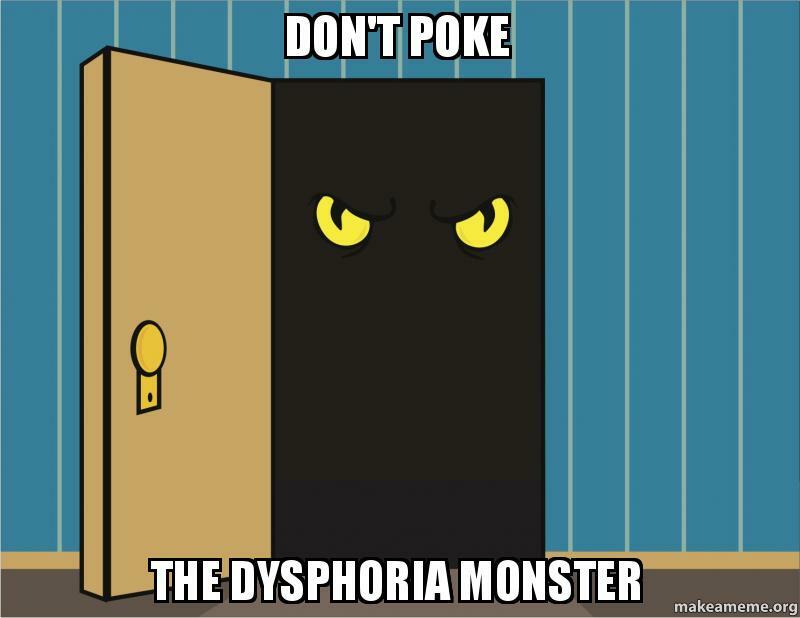 It’s important as the loved one of a transgender person that you don’t “poke the Dysphoria Monster”. Be aware of the fact that this monster is lurking nearby and that it is in your loved one’s best interest that the monster stays docile. Unfortunately, parents and partners (and other loved ones) can fairly easily poke the monster because they are usually the ones who are around the individual the most. This can happen in any number of ways: misgendering (using wrong pronouns), using birth name, commenting on body parts, commenting on appearance, giving tips on how to be masculine/feminine, the list goes on. Educate yourself on dysphoria. Don’t expect your loved one to do it all for you. Understand what can be the most distressing parts of being transgender. Use compassion to fill in the blanks you don’t understand. Check in. Don’t be afraid to ask, “How’s your dysphoria?” (or whatever word they would like you to use). Usually they will know exactly what you mean, and you will get the most direct answer that way. Ask them what triggers their dysphoria the most. This will help you not only learn to avoid causing these triggers yourself, but will be alerted to check in after you witness one of these triggers happening. Ask what helps lower their dysphoria. Ask when they feel the least dysphoric, and then try to increase or replicate these experiences/situations. How big is your or your loved one’s Dysphoria Monster? Would you describe it differently?